You'll be £16.99 closer to your next £10.00 credit when you purchase 95th Rifles - 1800 to Corunna. What's this? Order within the next 6 hours, 58 minutes to get your order processed the next working day! 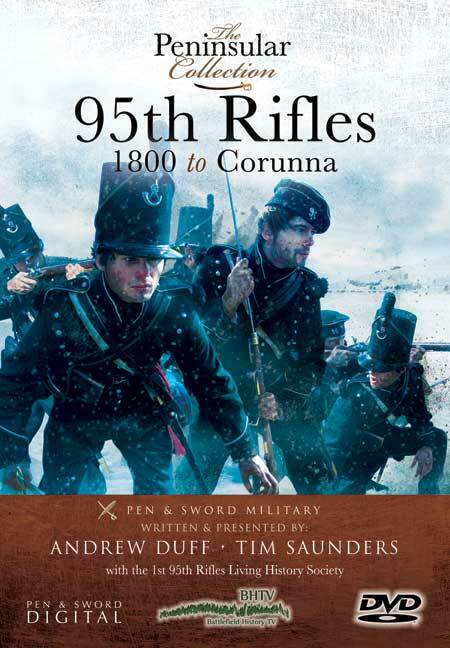 95th Rifles 1800 to Corunna is the next DVD in The Peninsular Collection from BHTV and Pen and Sword Digital and explores the history of the 95th Rifles, who were masters of the battlefield and particularly skilled in skirmishing. Held in high esteem by the French and Allies alike, they played a momentous role in the outcome of the Peninsular War. Following the events set out in the Salamanca DVD, this film serves as a prequel to explain the years leading up to the Battle of Salamanca, starting with Sir John Moore's retreat to La Corunna in the winter of 1808/1809. In November 1808 the British army advanced into Spain with orders to assist the Spanish armies in their struggle against the invading forces of Napoleon. The army had advanced to Salamanca when Moore judged that the Spanish forces were beaten, and considered that to avoid disaster he must give up and retreat to the coast. Before doing so he seized an opportunity to threaten Napoleon's communications with France hoping that he might divert his forces and give other parts of Spain and Portugal a few months respite in which they might reorganise. Napoleon responded with customary swiftness and decisiveness, directing his marshals to try and trap the British, himself leading an army in forced marches in spite of winter conditions. Moore had anticipated that he would have to be ready to make a run for the coast and he managed to keep ahead of the pursuing French and avoid entrapment. The retreat of the British, closely followed by their French pursuers, took them through mountainous terrain, in dreadful conditions of cold and snow and was marked by exhausting marches, privation, and suffering. On the march the British army lost 3,000 men with 500 more left in hospitals. At times the discipline of the British broke down but eventually they reached the port of Corunna, where they expected to find a fleet to take them back them to England. As day broke on 16 January the French were in position on the heights, and all through the morning both armies observed each other across the valley between them. Moore planned to continue with the embarkation later that day if Soult did not attack. By afternoon Moore considered an attack unlikely and ordered the first divisions to make their way to the port; the rest of the army would follow at dusk, but shortly after, at 2pm, he learned that the French were attacking. Soult's plan was to move against the strongly-placed British infantry of the left and centre in order to contain it while the infantry division of Mermet attacked the more vulnerable British right above the village of Elvina. The cavalry was deployed further west near the more open country leading to Corunna. If the attacks succeeded they could seize the western end of the British lines and push on to cut off the bulk of the army from Corunna. Filmed on location where the original battles took place over 200 years ago, the BHTV team experience first-hand the diversity of the Spanish weather in winter with rain, sleet, snow and sub-zero conditions, giving the viewer an idea of what the British and French troops had to endure at the time. Complimented by re-enactment footage from the 95th Rifles Living History Society, this DVD is compulsive viewing for all students of the period. This DVD is the best of the three from BHTV that we have seen thus far. It is the first of three DVDs regarding the history of this famous regiment and begins with the creation of light infantry units in British army. It is the retreat to Coruña though, an episode that placed the 95th in the annuals of the most respected regiments in the British army, on which this DVD focusses. The retreat, one of the finest ‘hours’ of this famous regiment, is presented as a vivid, “warts and all” description. The actions of the 95th are recounted and juxtaposed to the ill-discipline of much of the rest of the British army. A highlight of the DVD is that the footage was taken on location and at the same time of year as the historical events. This adds greatly to the value of the presentation— particularly with regard to the retreat to Coruña.